Nvidia, one of the largest manufacturers of graphics cards for your laptops and PCs, has recently announced their next range of advanced graphics cards. The first in the 2000 series, the RTX 2080 and 2080 Ti were announced at the Gamescom 2018 press conference. The 2000 series option is set to revolutionize the gaming arena with its emphasis on the Ray tracing technology. How does the new RTX 2080 fare against the old generation GTX 1080 (NVIDIA RTX 2080 vs GTX 1080)? That is precisely what we will be covering in today’s comparison. The Nvidia RTX 2080 – What’s new in it? The RTX 2080 is one of the two new range of 2000 series of GPUs announced this year. The graphics cards will be made available from September 20, 2018, along with its sibling, the RTX 2080 Ti. The change in the name may surprise some of the die-hard Nvidia followers. Yes, Nvidia has dumped (not officially) the prefix GTX from its new range of GPUs in favor of the RTX. The RTX in the name would be indicative of the Ray Tracing technology incorporated within the new range of graphics cards introduced by Nvidia. Ray tracing technology is what would help you get a lifelike video experience in your games. So far available only in the movie and TV shows, the ray tracing technology focusses on working with the travel of light exactly as it does in case of the real world scenario. 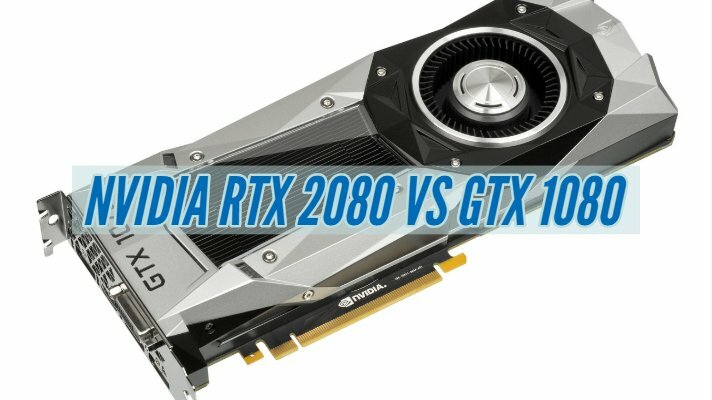 NVIDIA RTX 2080 vs GTX 1080 – What’s Different? The best way of understanding two competing products is to go with the comparison chart. The side by side comparison would indeed help you arrive at the right kind of analysis. From that perspective, here is our comparison chart for the GTX 1080 and RTX 2080. Please note that in addition to the CUDA cores on the RTX 2080, it also comes with Tensor cores from the Volta architecture and RT cores from the Turing architecture. We have not included these aspects in the above chart as the Pascal architecture on which the GTX 1080 is based does not have access to either Tensor or RT cores. The Tensor cores are used for deeper machine learning and AI capabilities, while the RT cores introduced with the Turing architecture are used for the ray tracing. Ray tracing will help you get the best effects of light and provide you with a lifelike movie kind of immersive experience in your games. Well, the new RTX 2080 has not yet been launched. The GPU based on the Turing architecture has just been announced and will be launched on September 20. 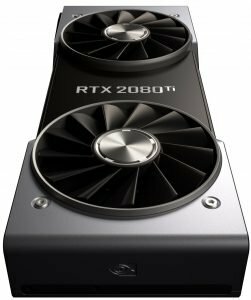 That said, our comparison is based on what we know so far about the newly launched RTX 2080. Check out our comparison on a few critical features for a better understanding. See above. The GTX 1080 which was launched in may 2016 and was priced at $ 549 during launch. If you are looking at the founder’s edition option for the GPU, you will need to shell out a little more premium. The RTX 2080 is expected to sell at $ 699. However, prices may vary based on the retail channels. That may not be a higher price given the improvement you will be witnessing with the new RTX range of graphics cards. Given the fact that it is a high-end GPU, we were not expecting a lower price either. However, once the graphics card is launched, the price may come down after a while. At least, that is what we have experienced with the GTX 1080 as well in the past. The Pascal architecture was introduced in 2016. The GTX 1080 was based on this and a showcase for the 16 nm manufacturing process. The RTX 2080, on the other hand, is based on the new age architecture from Nvidia. Yes, we are talking about the Turing architecture. The Turing architecture introduced the RT core concept along with the tensor cores and CUDA cores that previously existed on a Nvidia graphics card. The RT Cores would determine how the light and sound would travel in a 3D environment. The technology helps process the ray tracing better than the GPUs with Pascal architecture. In fact, Nvidia claims that there will be 25 percent improvement in the ray tracing functionality. Of course, the advantages of the Turing architecture are more pronounced in case of the high-end Quadro series of graphics cards like RTX 8000 and RTX 6000. But, the consumer level GPUs like RTX 2080 and RTX 2080 Ti also benefit from the enhancement to the technology used. Along with the RT cores, the Turing architecture also carries forward the tensor cores introduced with the Volta architecture. The tensor cores are designed to provide an enhanced Artificial Intelligence-based performance and rendering. Another advantage offered by Turing architecture as opposed to the Pascal architecture involves the adoption of GDDR6 memory standard. It can also help you 18.6 billion transistors in comparison to the 11.8 billion transistors on the Pascal architecture. Moreover, the GDDR6 standard would help you achieve the high speeds up to 14 Gbps. You can expect a huge difference regarding the specifications of both the GTX 1080 and RTX 2080. The GTX 1080 offers you an 8 GB of GDDR5X memory characteristics and a 10 Gbps memory performance. The memory bus has a width of 256 bits and a memory bandwidth of 320 GB per sec. The RTX 2080, on the other hand, will offer you the specifications much higher than its predecessor. You have 8 GB of GDDR6 memory with a 14 Gbps speed. You will get the same 256 bits memory bus width, but a higher memory bandwidth of 448 GB per sec. Other specifications also have a huge difference. As opposed to the base clock speed of 1607 MHz on the GTX 1080, you can get a 1515 MHz speed. The boost clock speeds respectively are 1733 MHz and 1710 MHz. The number of CUDA cores on the GTX 1080 would be 2560, while those on the RTX 2080 read 2944. You will find that the specifications are higher enough for the RTX 2080 when compared to those on the GTX 1080. The higher number of cores and faster video memory are a couple of aspects you would appreciate. Well, the review samples are not yet available for the RTX 2080, nor do any user reviews. The specifications available may not be sufficient enough to paint a clear picture of what we can expect from the RTX 2080. Of course, a few game developers have already pledged support for the new platform and looking at them, and it can be safely assumed that we can expect a hike of around 1.5 times regarding performance as compared to the GTX 1080. Well, we would consider that the situation is still nebulous enough. We currently have only the numbers. Of course, we have had an experience with the GTX 1080 graphics cards already, but when it comes to pitting it against the upcoming RTX 2080, you will need to have access to the actual graphics card so that we would be able to put it to some real-world test. That may not happen until September 20 as that is a date set by Nvidia for launching the new 20 series Turing architecture-based graphics cards RTX 2080 and RTX 2080 Ti (the third one in the series, the RTX 2070 will be launched in October). However, on the paper based on those specifications, it seems promising enough to opt for the new RTX 2080. However, please note that the new RTX series is based on the ray tracing technology and as such one of the high-end options for your GPU requirements. From that perspective, would it be wiser enough to shell out more – especially when the ray tracing has not yet been the mainstream technology as yet? Give it a thought and take a decision that would indeed meet the right set of requirements you have.